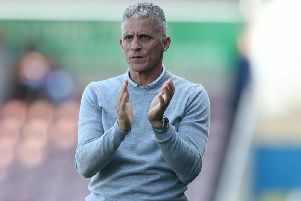 David Buchanan has revealed the timeline of events that led to a man racially abusing Cobblers players at the Village Hotel in Nottingham on Saturday. A number of the Town squad reported on Twitter following Saturday’s 2-2 draw at Notts County that players had been abused prior to the game as the team set off on a walk ahead of their pre-match meal. Buchanan was in the group that set off for their traditional pre-game stroll, and admitted he was stunned to hear what was said, and he also praised the Cobblers players for showing restraint as the abuser threatened to get physically violent. Buchanan revealed that the man in question raised a chair after being confronted by some of the squad following his abuse, and that the players acted in a professional manner to ensure things didn’t ‘escalate’. “We were in the hotel and sitting about, waiting to go for our pre-match walk,” said Buchanan. “Some guy came through the hotel, and I heard him call somebody a muppet, but we didn’t really know who he was speaking to. “We presumed it was Aaron Pierre, and out of all the people to call a muppet he is the last you want to do it to! “But we just brushed it off really, and as we went outside the hotel, the same lad was there, sat down with his girlfriend. “As we walked down the steps he was mumbling stuff, but we didn’t really know what he was saying. “I was walking with Junior Morias at the time, and said ‘I am sure he is staying stuff there’. So we stopped and turned round, and he was shouting from the top of the steps to the bottom of the steps. “He was shouting stuff and, quoting him, he said ‘all you white lads will play much better today, because you black lads have got no heart’. “We were just like ‘has he really said that?’ A few of the lads asked him to repeat himself, and he said the same thing again. “As you can imagine none of us were happy. We continued with our walk and when we got back he was still there, and Junior and a couple of the other lads confronted him, and asked him what his problem was. “The lad then picked up a chair, so we just calmed things down. “It could have escalated further, but credit to the lads for being professional, and they handled the situation really, really well. “What would have happened if one of them had lost their heads? If they had gone and thrown punches or beat the buy up, it was called for. And he added: “That is as far as it went, as once it all kicked off there were members of the public in the hotel who started to film what was happening. “I went into reception and told them somebody had racially abused our players outside, and that they needed to sort it out. “By the time they had reacted to it, our players had gone inside, and from then on it has been a situation of letting the club deal with it and they have put a statement out there. “I think it is important we deal with it as a football club. “It amazes me how things like that can happen in today’s society, and it is the first time I have seen it in a hotel, from just a general member of the public. In the wake of the incident, the Cobblers issued a statement on Sunday and it is understood that they have been in contact with the police over what happened at the hotel, which is about seven miles away from the Meadow Lane stadium where the game was later played. The statement read: “Northampton Town Football Club confirm that a number of the first team squad were racially abused ahead of Saturday’s game at Notts County.